Glaro Incorporated, the leader in USA bellman cart manufacturing, announces its Universal Quick Ship Program, which sends bellman carts and platform trucks out the door in a matter of days. We are more flexible because we do everything in-house and our manufacturing operation is set up to be efficient so that orders can be rushed through. If you cannot wait weeks and months to receive bellman carts, Glaro Inc. has the solution to significantly shorten delivery timelines. Customers maintain the ability to choose from numerous options to order carts and platform trucks. Glaro Inc., the leader in USA bellman cart manufacturing, announces its Universal Quick Ship Program, which sends bellman carts and platform trucks out the door in a matter of days. If an item is in stock, it ships even faster, according to executives. A recent interview with Plant Manager, Robert Glass, revealed that “other companies are not able to conduct business this way, particularly when their carts are imported from other countries.” Glaro Inc.’s carts are all made on American soil, employing local staff. “Glaro competitors also cannot offer such a broad line with their imported carts. We are more flexible because we do everything in-house and our manufacturing operation is set up to be efficient so that orders can be rushed through,” added Executive Vice President Robert Betensky. Glaro’s sister line of ‘workhorse’ platform trucks are manufactured and shipped with the same high standards and speed. Platform trucks are built to transport large quantities of luggage and equipment and are geared towards hotels, condos, college dorms, senior living facilities, and other institutions. “Quick shipping has always been a priority at Glaro Incorporated. Every employee is trained and works towards upholding this level of service for which we have become known,” says Vice President Neal Glass. Carts and matching platform trucks are available in a range of sizes, finishes, deck coverings, customized logos, other options, and price ranges. For more information, call Glaro Incorporated at (631) 234-1717. Glaro Inc. (glaro.com) is a leading USA manufacturer of commercial and consumer aluminum and steel products sold directly to distributors/dealers for almost 70 years. All products ship in 1 to 3 days. 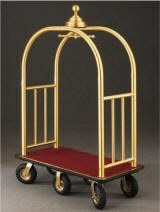 Product lines include bellman and luggage carts, platform trucks, waste receptacles, recycling receptacles, smokers’ posts and receptacles, crowd control posts and systems, safety barriers, signs, sign frames, directories, menu display stands, coat hanging equipment, coat trees, umbrella stands, wet umbrella bag holders, metal planters, and key drop boxes. The company is known for its quality merchandise and its ability to consistently quick ship all products. The customer service department provides unusually prompt personal service and is sensitive to the needs of dealers and distributors.